Snow-peppered peaks, chocolate tasting, cows and cheese – the four ‘hooks’ I’d teased my companion with. Lisa, a charmingly fiery character with enough anecdotes to keep you entertained for an infinite number of train journeys, didn’t bite, as I tried to entice her with a trip to Switzerland by train following a conference in Turin . “How about a trip to Europe’s highest train station…3571 metres to be precise”, my email ending with an ellipsis…the tone changed, and 2 weeks later we set off on our adventure to Switzerland by train! As we head ‘up hill’ from Turin into the Alps our train swept passed the majesty of Lake Maggiore. The tracks hugged the edges of the water as we dodged an undulating landscape. And, as the guards changed, their greetings morphed from ‘Ciao’, ‘Bonjour’, to the occasional ‘Guten Tag’, as Italy gracefully transformed into Switzerland. A five-hour journey to Interlaken flew by. Cosy chalets, turquoise lakes and white speckled peaks entertained, with only the cows missing. Interlaken ignited as our train drew into the station. We joked – this quaint town jacketed by the Alps seemed untouched for a century, yet awoke as its latest guests arrived. Blue skies bustled through the cloud cover, picnic blankets sprouted from the lush green grass that centred the town, and a man dressed ready for a black-tie soirée waved ice creams in our direction. Interlaken is tucked between Lake Thun and Lake Brienz, but dominated by the dusted summits of the Eiger, Monch and Jungfrau. Relaxed to a point that time barely passes, the town was built as a mountain escape back in the 19th century; marvellous and typically Victorian buildings still proudly mark the town’s history. Following my default travel advice of ‘dump your bags and head out for a walk’, I found Lake Brienze to the east. As the sun set behind me its clear waters transformed from emerald green to dark blue, blending with the shadowed mountains emerging from its tranquil surface. I found a small jetty jutting into the water, hung my legs over the edge and lost all track of time. Bliss. With its sides bleeding out of view between two sister peaks, Jungfraujoch gently dwarfs the town like a watchful ancestor. When in Interlaken the surrounding peaks allure. My mission, Jungfraujoch, is the most momentous. With its sides bleeding out of view between two sister peaks, it gently dwarfs the town like a watchful ancestor. At Interlaken Ost we hop on a train to Lauterbrunnen, “the valley of the waterfalls” that so enchanted Lord Byron. Local guide Erika Mattle waxes lyrical about the summer walks. I could see why – forests flow through constantly changing views, and as a country lad myself I’d quite happily pick up a stick and head out exploring; quite possibly with a blade of grass between by teeth. But, it was the tail-end of the ski season so our panoramic train was full of skiers catching the last of the flakes. I’d wanted snow, so the body suits and ski-mask tan lines were reassuring. It’s from Lauterbrunnen up that the rolling tracks transform into a graceful clog. Pulling out from the station a gentle 20 degree angle confirms this. The journey took a more relaxed pace and frequent gaps in alpine shrubbery treated with framed stills of sweeping valleys. Nowhere have I travelled where the power of water and ice is more apparent. Valleys lurch from side to side, bearing millennia of scraping and shaping as powerful glaciers scarred the landscape. With winter retreating, a graceful carpet of grass cloaked the ground scattered with shooting flowers competing for space; snowy peaks, dark blue mountain ridges and verdant countryside is a picture of Switzerland by train never forgotten – well that and the Lindt logo. The next stop, Wengen, is the highest point you can use your Swiss pass. 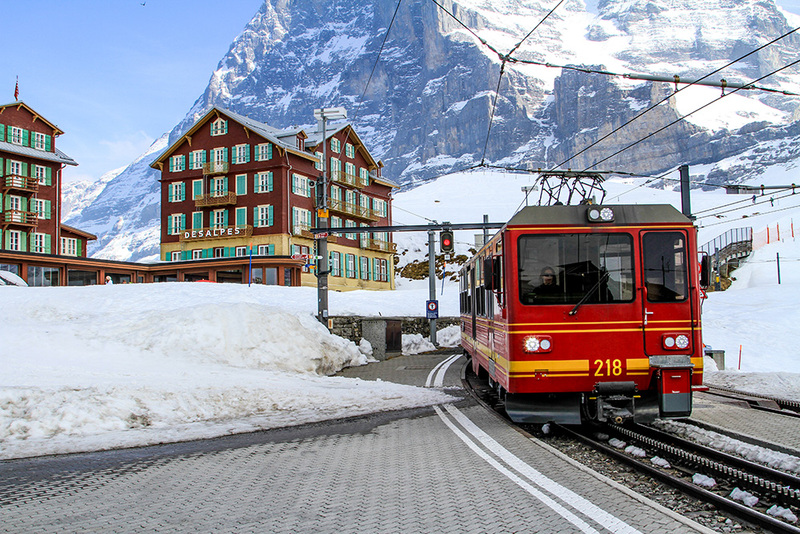 From there it’s onwards via Kleine Scheidegg, where you board the classic red wagons of the Jungfraubahn for a further 1500 metre climb. The train bores its way through the Eiger Mountain, resurfacing sporadically to give bewildering new perspectives on the picturesque scenery seen earlier. At 3571 metres double doors glowed like gates to a mythical land – beyond, a white world of snow and clouds.What’s coined as Europe’s longest glacier, stretching 20km, stood still before me; a never-ending snow covered river forcing its path through the landscape – and temporary tennis court for Federa when he took his own trip to ‘The Top of Europe’. The summit towered above us, perhaps savouring it’s path of glory for those who hadn’t taken the train! It was a different land. One protected by its own danger and peril, yet magnificent in its beauty. When: Winter sees landscapes transformed by snow and the town’s alive with the magic of festivity, hosting an incredible ice rink in the centre. Summer, and the countryside is lush, yet peaks still remain dusted by the white stuff. May – September is perfect for hiking or gentle walks, rail trips to the top of Jungfraujoch and opposing Alpine range, and of course picnics by the lake. How: London to Interlaken by train in a day is a breeze, but an overnight in Paris is always nice. A Swiss pass will whisk you around Switzerland by train, but also on the boats that ferry up and down the lakes. If you’re going it alone loco2 is a great place to start in terms of booking trains. For more of a package holiday, I would recommend a company such as Railbookers who can tailor make a holiday inclusive of all the different things you want to do. Titan Holidays: If you’d like to do something similar to this trip but want to book it through a Tour Operator, then I would recommend Titan Holidays. How Long to stay in Interlaken: Stay a minimum of two days for Jungfraujoch – it is a full day excursion and you’ll want another day to explore Interlaken. But, there is plenty to amuse for a week if you wished. Chocolate: Whilst in Interlaken I visited the ’Funky Chocolate Club’. Sounds a little too much like strenuous activity but pop along for a go at chocolate making – it’s great fun and you can eat as much as you like! 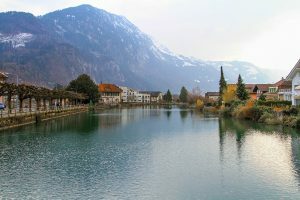 Eating out: Interlaken has a variety of top restaurants, particularly alongside the main park – fondue is always accompanied by breath-taking views. Head off the high street towards the river for more authentic cuisine.